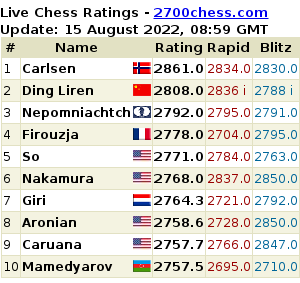 While the appearance of a new Russian chess site can hardly compare with the bombshell of Magnus Carlsen dropping out of the candidates matches, chess-news.ru has also exploded into life. Apparently the brainchild of chess journalist Evgeny Surov (you might remember his videos from the recent Olympiad), it’s already full of content, including interviews with Aronian and Kramnik (I hope to post at least a partial translation of the latter soon) and a video and photo report from the drawing of lots by Evgeny Potemkin, from where I’ve taken the photos below. The new site clearly has the potential to fill a gap in the market, as previously there was no Russian equivalent to Chessbase, Chessdom or ChessVibes. The best illustration of that is in fact the Carlsen story today. Neither of the big-two sites, ChessPro or Crestbook, is set up to report on news (e3e5 will no doubt post a link to other sources at some point, but no report), which is where Chess-News can step in. Admittedly running three short pieces on the story is a sign that as well as some technical problems (I’d personally like to see the page fitting on my Netbook screen!) there are also editorial issues to work on. Anyway, moving on to the interview. It was conducted last night by Evgeny Surov, and you can also listen to it (in Russian) here. It’s worth bearing in mind Aronian’s sense of humour – you could add (laughs) after many of his comments! Levon, what does a person feel on achieving the 2800 mark? Well, no doubt, calmness. I mean that you’re no longer nervous about wanting to attain something. So now I can just play calmly. It’s not that it’s such an important mark, or that it decides something, but nevertheless it gives you a good feeling to have got such a rating. But what does it mean “to play calmly”? Do you really have less of an incentive? It’s not that there’s less of an incentive, but it removes some of the nervousness. You know, each little thing makes a person nervous. The first time you enter some sort of open, or the first time you read a book by some author. It’s the same thing – you’re nervous about it, not knowing what to expect, and then that passes and you can move on more calmly to other tasks. I’ve noticed that almost everyone is congratulating you here. Did you expect such a reception when you crossed that rating barrier? No, not really… I don’t know, perhaps there’s even an element of humour. Of course, there’s no reason yet for congratulations. But still, I’m glad… Perhaps it really is important in some way. 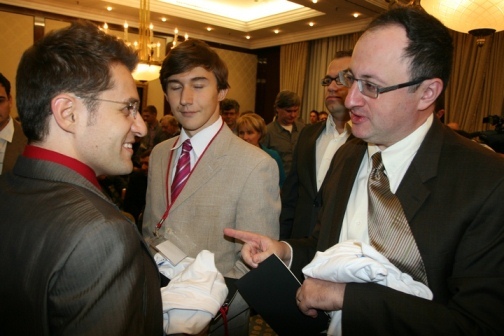 Gelfand congratulating Aronian on reaching 2800? What’s your mood like before the Tal Memorial? What sort of thoughts and plans do you have? It’s not every day you play in such a well-organised tournament, so I’ll try to demonstrate my best game, to justify my presence here. The drawing of lots decided that in the first round you’ll have to meet perhaps your main competitor. Or do you not feel that way? Sorry, but competitor for what? I don’t know. It strikes me that everyone here is competing for first place. And I don’t know if you know it, but according to the expected result you’re first? According to whose expected result? There’s such a mathematical thing, Eduard Dubov calculates the expected results. He calculates current ratings and worked out that you should be first at the tournament. That’s very nice. If he can only convince my opponents of it then it would be even better. But in my opinion that’s a little ridiculous. Overall it’s not important who you start the tournament against? Overall, of course, it’s not important. It’s better, certainly, when you’ve done your job before the last round and then in the last round you can play more calmly while your opponent stresses. But here the thing is that tactics are something you work out as the tournament goes along. You have to adapt to everything.